For now I'm going to focus on getting Ruby's Novice and Intermediate titles, but while Boca doesn't have the same enthusiasm for tricks, she's proven herself quite capable of learning. One of my trick training goals with both girls was to have them sit pretty in unison, with enough distance/duration that I could get good pictures. Boca had no balance to start with, and now she is sitting up as long the treats are coming! We still have a ways to go in order for me to phase out my luring with Boca, but she is starting to offer sit pretty regularly. Each week, the tricks are assigned along with tutorial videos. Members are encouraged to post their video progress before Sunday of that week. By the end of the class the dog will have learned the requisite number to achieve the corresponding title. Yesterday we submitted our first video to our Novice Team on Facebook. 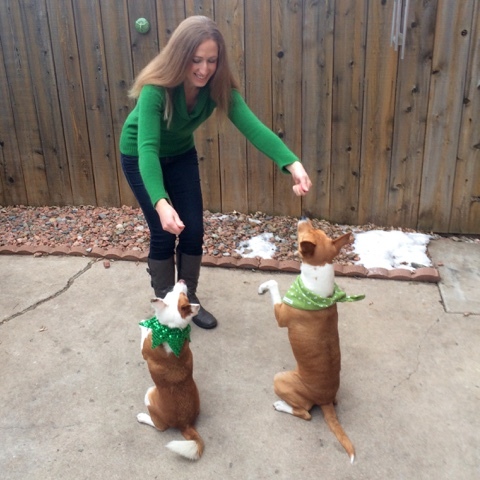 It's been so fun to see all the dogs' styles and get pointers from the instructor, Sara Carson, and the members. I highly recommend joining in if you have any interest in trick training! Filming and watching our video showed me just how much polishing we have to do even on the things Ruby knows already. None of these tricks were new to Ruby but it was obvious that the return to basics will do us good. We have been practicing "sit pretty" so much that Ruby forgot how to just plain "sit!" She can also spin both directions but we call the other way "twirl." Ruby's nose touch needs work as well - she tends to touch me with an open mouth of teeth instead of her nose. The Heroic Sparks group is going to provide the motivation, inspiration and accountability to stick with our trick training on a regular schedule all while propelling us to our first title. This post is part of the Positive Pet Training Blog Hop, hosted by Cascadian Nomads,Tenacious Little Terrier and Rubicon Days. 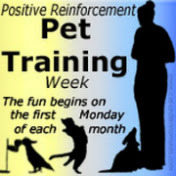 This month's theme is National Train Your Dog Month and the next hop begins on February 1st. The hop happens on the first Monday of every month, and is open for a full week - please join us in spreading the word about the rewards of positive training! That is so cute! That must have been a tough one to train! I hope to one day do the trick title thing with Luke. With our house up for sale and the prospect of moving soon I just don't think this is the right time. But I want to follow along with you and see how it goes! We are working on him spinning in the other direction now - thanks for the idea of what to call that! Love! I'm working on the Do More With Your Dog novice title for Atka. He's a lot like Boca - certainly not a trick dog, but a great learner. Since these tests don't have to be conducted indoors, I can involve Mauja, too (she gets super stressed in buildings and can't focus). Unbelievably cute! Congrats on taking the next step with Ruby. And I'm with you, I've never liked the idea of asking a dog to Play Dead. Ruby is SOOOO adorable. That was fantastic. And I agree with the "play dead." I do miss the accountability gained from working towards titles. You may have inspired me to find some online titles to work on again- we loved Treibball and freestyle! Mr. N has his novice title so far. I'd like to get his champion title at some point. That march trick is really cute! I just love her marching trick! I want to try out trick titles with Nola and Rule. I know I've already told you, but I love, love, love the marching!! Ruby's video is so cute! Great job! I love the marching! The marching trick is super cute!! Of course both girls are super cute. Good job and it'll be fun to watch their trick evolve. I love your videos! I was going to post Dante's trick videos today but I accidentally deleted them!! :-( SO now I need to rerecord and then post lol. Oops. Oh my gosh! I love to see owners who work really hard at teaching dog manners! Well behaved dogs stay in their homes!! Great video! I love Ruby's focus and enthusiasm! I especially loved how still she was during the "relax" and then how quickly she bounced back up. Good luck in your adventures. We wish you the best. I fun is that? I miss having a dog to train. I truly enjoyed my time training my German Shepherd years ago. It's such a nice time to bond, and shows discipline for both of you. Thanks for sharing. I am so excited that we're going to get to see videos of you and Ruby training every week! I love watching her borderjack mannerisms. I also love taking online classes, especially since they taught me to video training sessions. This free tricks class seems like a great way to try out the medium in a low-risk way! I love "march". You're right - I don't think it's possible for her to be more cute. I've thought about a trick title for a while... thanks for telling us about the FB group. I'll try that later. I can't wait to see more from you!